Over 2000 years ago, a Greek historian Callimachus of Cyrene (305BC-240BC) made a list of wonders around the world which later became known as "the Seven Wonders of the World" and included The Great Pyramid of Giza, The Hanging Gardens of Babylon, The Statue of Zeus at Olympia, The Temple of Artemis at Ephesus, The Mausoleum at Halicarnassus, The Colossus of Rhodes, and The Lighthouse of Alexandria. Six of them do not exist any more. The Great Pyramid of Giza is the only one still remaining to this day. Although we know of them only from written documents, nobody doubts they existed. There is also no question of their purpose and that they were made by human hands. The approach to the Egyptian pyramids is completely different. They still exist, and their tremendous size is awe inspiring. All attempts to explain the methods used to build them are not convincing. Some writers even suggested that the pyramids were constructed with the help of extraterrestrials. In many of the publications about the pyramids, there appears an opinion of our “pyramids inferiority complex”. According to it, even today, with our modern methods of planning and construction, it would be very difficult to build the pyramids. At the same time, we create structures like dams, highways, and huge tankers that are much bigger than the pyramids. Strangely these modern structures do not impress us much since we understand their purpose and we take them for granted. The "pyramids inferiority complex" is most likely a result of disbelieve that the pyramids were built to serve as tombs for the pharaohs. It is difficult to find proof that a particular pyramid was built for a particular pharaoh and only few clues remain indicating that construction was conducted when a specific pharaoh was the ruler. The mystery behind the purpose of the Great Pyramid causes people to look for some very special meaning in its dimensions, proportions and design of the chambers. The shape of the pyramid is supposed to have magical powers that would protect a person from harmful cosmic radiation and ensure natural preservation of the mummified corpse. It is much easier to believe in such fascinating tales than in the idea that a Pharaoh would start the construction of his tomb immediately after rising to power, without a likely chance of finishing it during his lifetime. Personally, I think that everything created by man had its beginning in an attempt to meet a practical need. This should also apply to the pyramids, with the later successive copies possibly being built to fulfil Pharaohs’ vanity, for religious purposes or for other irrational reasons. It is rather puzzling that the biggest Egyptian pyramids appeared quite suddenly. New architectural forms were created by using new construction methods and material not used before on such a large scale. Colossal mountains of stones, with chambers inside that were no more than 1% of the size of the volume of the entire structure, started appearing around the year 2650 B.C.. After 2450 B.C. building of such immense structures ended. Pyramids that were built later were not as monumental, and only their shape remained the same as their predecessors. Their construction did not require so much time, material, and effort as before, when pyramids of Cheops and Chefren were built. The construction cycle required to build the pyramid of Cheops or Chefren was at least 20 years. Considering that at that time an average human life span was about 30 years, at least two generations of workers had to be involved in the construction of each of these pyramids. What higher purpose motivated people to continue construction for periods longer than the lifespan of one generation? What motivated the Egyptians to build huge stone pyramids one after another for over 200 years of the III, IV and V dynasty of pharaohs? Why was the trend to build huge pyramids, made with the use of big stone blocks, so short within 5000 years of Egypt's history? Why did the Egyptians, who usually meticulously documented all areas of their life, fail to describe the construction of the Pyramids? Were hundreds of tons of the red granite brought from the quarries located 1000 kilometres away south in an upper Nile? These are questions without good answers, and even more questions will appear when we start exploring the details of individual pyramids. When twenty years ago I was trying to construct machines that might have been used to build the pyramids, I did not ask such questions. My only goal was to experiment with construction machines designed like a human knee which, like everything in nature, ignores discovery of the wheel turning on its axle. For my generation, Egyptian pyramids were a perfect example of structure build without the wheel. Using Pyramids as a model, I tried to popularize my machines applying principles of the differential levers, moving pulleys and rope transmission. My designs have not become popular because hydraulic systems replaced most of the simple machines and maybe because trying to use the Pyramids for such plain applications may have angered the spirits of the rulers of the ancient Egypt. The “Curse of the Pharaohs’ ” followed me for nearly 20 years during which I could not stop thinking about the Pyramids building and its various intrinsic aspects. My experiments with models in 1:1 scale of my construction machines clarified many things for me (they were presented in 1983 on Polish TV in the Wanda Konarzewska’s show). There are many possible solutions based on mechanics of the knee joint that could have been used in making lifting machines(I have described them in my article "How the Pyramids were built" published in magazine "Problemy" No 8, 1986) and in the end, it became less important to me how the stones were really lifted. Was a pyramid erected step by step (level by level) or from one side up? Were the stones had come from and how were they transported? Could builders work on the south wall of a pyramid in the heat of the sun shining on it under almost the right angle? Human imagination has no limits. Recently a new theory was proposed suggesting that pyramid stone blocks were made of some kind of concrete. I have nothing against such theories since they stimulate thinking and experimentation with new materials. Also they do no harm since they are addressed to adults who can be sceptical about such revelations. I would not rush to publish my theory about the Pyramids (my plan was to wait with it until my retirement) if it was not for the recent new circumstances. 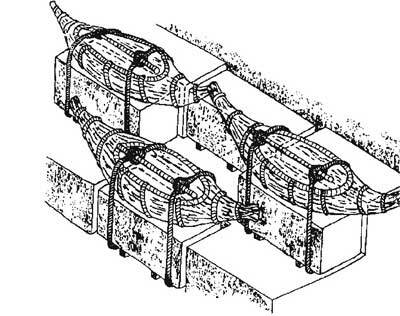 Authors of these books are trying to convince children that the pyramids were build by pulling stones on wooden rollers logs up the ramps as shown on the picture below. 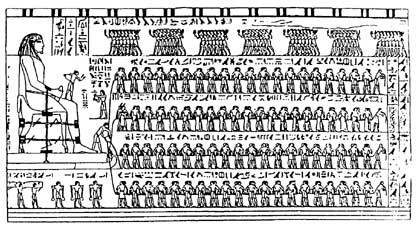 Looking at such pictures children may draw conclusion that building pyramids wasn't difficult as long as there were enough people to pull the ropes. They may think that Egyptians were rather primitive people who built their pyramids by using only slave labour of thousands of workers. The reader can easily miss the fact that this drawing is in conflict with the laws of physics. Fig. 2 Enlarged part of the previous drawing. In another part, where the ramp is changing from an inclined section into a flat surface, a stretched rope would have to press down on the edge. Let’s hope that slaves would not get hurt by the rope pressing their hands against the rough surface of the ramps edge. Writing a book for children does not give one a license to spread naive ideas about methods of transportation of 2.5t stone blocks. Not only pulling such a long rope that is turning on the ramp is impossible, but the idea of transportation based on just few such ramps attached to the sides of a pyramid is illogical. The pyramids exist, the stone blocks used to make them are counted, and the time to build them is well estimated in tens of books. The rate of construction, 120 thousands of stone blocks per year, is fairly well documented. We can accept it as highly probable, that such was the construction rate throughout the whole 200 years of pyramid building period. Assuming (for simplicity of calculations) 10-hours of work per day and 300 days of work per year, it is easy to calculate that the construction rate would be equal 40 stone blocks per hour. During this hour the stone blocks had to be elevated to appropriate height and precisely positioned in the right places. The groups of pulling workers would have to move with a speed of at least 2km/hour. Moving at such speed on an inclined ramp requires a lot of effort in itself and on top of it the rope would have to be pulled with a force of at least 20kG. Using this method of transportation people working in the heated by the sun wall of a pyramid would have to generate power close to 1 Horse Power, which is not possible. The authors of the mentioned above books for children cannot expect that choosing such methods of transportation would allow building a pyramid in just 30 years. 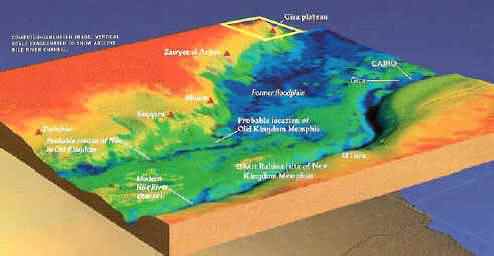 When dealing with ancient events, the accuracy is measured in years, however in physics the time frame is much more critical. The laws of physics were true 5000 years ago the same way they are true today. It is important to understand that the accomplishment of any work (labor) is limited not only by the force but also by the time the force is applied. The Power is restricted strictly by the minutes and seconds. The magnitude of the physical force can be increased easily with the help of the simple machines, however the time we cannot control. Ironically, Herodotus’ description of the pyramid construction agrees much better with the laws of physics than many of our modern publications. The concept of moving stone blocks from step up to another (tire to tire) provides a great advantage – it allows for a very wide construction area (front). It makes possible having, at the same time, many workers on the pyramid walls performing construction tasks at a slower rate. Let’s leave for now the details of building the pyramids, since we do not know for sure where the pyramid’s stone blocks came from, how were they produced and delivered to the construction site and, finally, why were the pyramids built at all. Recently, a sensational statement by American writer Zecharia Sitchin was published, in which he claims that a marking (a cartouche) on the stone in the ceiling of one of the chambers in the Cheops pyramid, so far the only link between the pyramid and the pharaoh's name, is simply a forgery. It is not obvious at all that pyramids were built in order to serve as Pharaohs’ tombs. There is no question that they were used as tombs, however we cannot be sure that this was the main reason for building them. The pyramids give impression that they exists independently from surrounding them buildings of the burial complex. Without any inscriptions on the outside and on the inside they are so impressive only due to their shear size. There is also no certainty that all the pyramids had smooth casing on their walls. A pyramid without the outer layer of casing stones is far less elegant than surrounding buildings and it reveals that the pyramid is nothing else but a heap of stones put one on the top of the other. 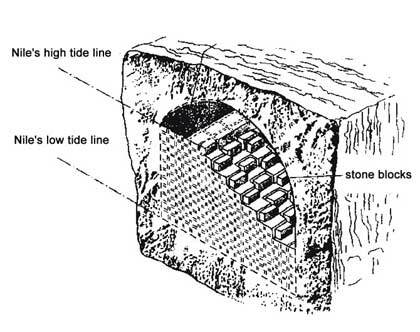 In modern times applying our criteria we would assume that stock of stones like that is rather a "pile" of stored materials for construction work, than structure itself. Or it could be good for nothing waste from some construction area. Approximately 70 Pyramids were discovered in Egypt, however 10 largest, with the combined volume of 10 million cubic meters, are located in the 50 km long area along the Nile. If we add to it all support ramps and buildings from the same area, like mastabas, small satellite pyramids, temples, walls surrounding burial areas and tombs, considering the quarrying methods, the pit left by the stones removed to build the above structures within previously mentioned period of 200 years of the Old Kingdom would have volume of 20 to 25 millions m3. The work of this magnitude should live much more noticeable mark than quarry in Tura. This raises a question: what is a bigger accomplishment, pyramids or the pit left after the removal of the stones needed to build them? If we consider the amount of work needed to achieve the task, then excavation of 25 millions m3 blocks of rock would take many times more energy than transport and pilling them up into the pyramids. If the stones for the pyramid building were cut out from one place, the pit created as the result would deserve more than the pyramids to be called The Seventh Wonder of the World. To explain this problem we have to go back in time to the III Dynasty of Pharaohs, to the year approximately 2650 BC when according to the majority of sources the pyramids did not exist yet. Let's try to imagine what could have been a priority for the rulers of Egypt at that time. 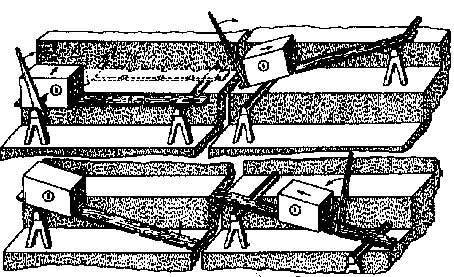 he proposes very ingenious technology used to move the pyramid blocks from the quarries to the construction site. NOTE: The following quotations from the book Different Story about Pyramids are Copyright by Andrzej Bochnacki. All Rights Reserved. Reprinted with permission of the author. Copyright 2005-2006 by Andrzej Bochnacki. "The height of the tunnel was less than 10 m. The tunnel was cut out on the level that allowed it to be dry when Nile's water was low. When the water level raised up about 6 m, almost all stone blocks from the tunnel could be picked up by boats from their spot”. ”Light, made out of papyrus, boats were put on the top of blocks and tided up with ropes. These transport boats ware waiting for raising water of the Nile and they could be easily towed to a chosen destination. The simplest way was to haul them to the west side of the Nile where water flooded the fields. Here they were left in the mud to be transported on the land after the flood was over”. waiting for high level of the Nile's. "The size of the hammering block was chosen to keep a very fast rate of tunnel building. That is why blocks were as big as possible. Their size was limited only by available methods of transport. Because they were transported by water the block weight was about 2,5 tons”. "How, in ancient times, the difficult problem of boats loading and unloading process was solved explains the animation and drawing below”. 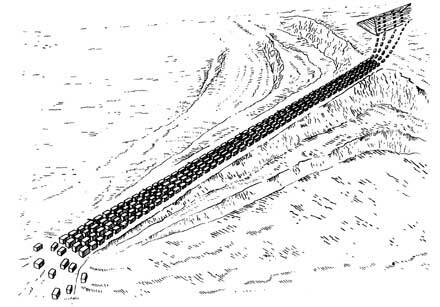 Animation showing phases of transporting stones from the tunnel to the ramp. This computer generated image shows probable course of Nile in Old Kingdom (the left channel). Note that Nile at flood stage pushed very close to the feet of major pyramid sites. This would make transportation of huge stone blocks from the quarries to the construction sites much easier. Transport of the 60-ton statue. the painter took himself a lot of trouble to show just the number of people in the team. one of the four pulling rows of peaple has different dress:as every second pair has long aprons and first pair has strange head-gears. ropes are not attached directly to the sledge, but to the element of strange shape. one of the workers probably pours some liquid in front of the sledge. Because it is physically impossible for 166 people to pull ropes with power of about 9 tons (probably it is sufficient power to pull 60 ton on the sledge), they had to find some equipment which would enable them to transfer the power and find any support to have possibility for increasing the pulling power. Only the trial of finding the reason, why the pulling row is different than other ones, helped to find most likely interpretation of the drawing shown below. 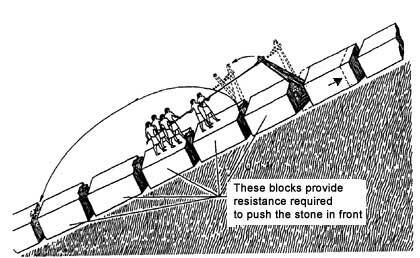 The Egyptians did not consider the problem of pulling heavy stones and statues theoretically, they solved it practically. They even checked that 300 or 400 people could not pull with power over 9 tones. Ropes made of fiber besides many advantages have one heavy disadvantage- they stretch up. Extension depends on the stretching power a kind of angle and length of the rope. If row of peoples would try to pull with one rope , the last people in the row had to made a few steps more than the first. Every slowing down the tension would make people to do new (great) effort of tension. And it is very doubtful that 50 people could find new supports for theirs feet and act synchronously. The Egyptians found brilliant solution. Spatial drawing of statue transport. It appears that when people try to keep running away rope in their hand, the situation changes diametrically. Rope tension is not a trouble any more, legs stand still, only hands change the place of grasp. Besides, a man catching running rope does not do any work, meaning power multiplied by movement, he is able to keep much more than pull. 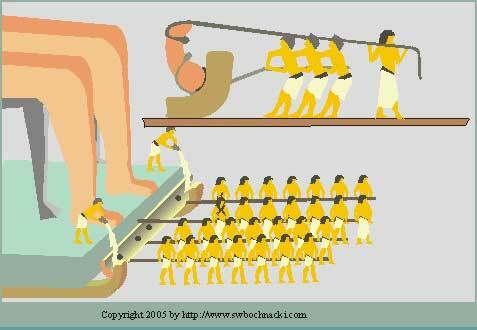 Egyptians created something like moving fulcrum, combined with the rows of pulling people, able to give a momentary resistance with 65 kG each, which gave in summary 8 tons. Only the fourth row distinguished by dress pulled and did the proper work of pulling the statue. 43 people pulled with power of 25 kG each, which gave in summary over 1 ton. Using very interesting element, the strange shaped wooden beam, which enabled transfer 1:9, workers could pressure the sledge and the statue with power of 9 tons. This power was enough to pull the statue and both sides resisting and pulling had some reserve. If we accept the dimensional proportion from the drawing, we can approximate movement of the statue in one round of work. If the beam spanned by 60 degrees in special nest at the end of runners, the movement of the sledge was about 6 cm. At that time pulling row moved forward within 54 cm, and then moved 48 cm backwards . Rows of resisting people moved 6 cm forward (but without doing any work) and a round might start again. Animation showing the method of increasing the pulling power. “We can push away the sixth stone from five stones connected together. Five or more stones always stay still, because the friction of a few stones is always bigger than the friction of one stone. So joining the stone in-groups we can move stone one by one. Simple wooden levers and wedges or only wedges will be completely suitable tools for blocks transport along the ramp. And we do not have to worry about friction, because stone platform coated thinly with sand, would be not only the transport road but also the tool smoothing the surface of stone block. It should be noticed that this method of transport did not need any special tools; it is the ability, which disappears in time, when this way of transport was not needed any more. "At the end of February the work was stopped because the raising sun hit also the northern wall. Then the stones were left on the platform just where they were placed. So when the next year work started people did not need to waste time for starting. "Sleeping" stones became "alive" and at the first hour after starting the pyramid was already rising". “Stones coming closer and away, like rings of a huge worn, could look from a distance like legendary walking stones”. Walking stones on the ramp. This kind of transport will be always less energy absorbing than classical team of men pulling heavy sledge and using 90% of platform surface to transport themselves. "Necessary power to pull the 2,5 ton stone along the wooden beam inclined about 30 degrees, was about 1600 KG. Using the lever with leverage 1 to 10, six people could successfully do this job, moving with small steps, let's say 4 or 5 centimeters. After 30 moves the block was one pyramid step higher and it was possible to do this work in time no longer than half an hour. Stones traveled on the northern wall of the pyramid, and finally were put in the right place." by Andrzej Bochnacki "Different Story About Pyramids"
"Special care was needed for outside stones, on which there were put precisely fit and smoothed face bricks. The gradient of the outside walls had to be very precise and they also had to hold the gradient of northern wall to enable the workers work for 100 days in shadow, when stones did not burn their feet and the air was not so hot that it made breathing impossible. Every day 100 blocks were put in a place of their destination and every day 100 blocks had to be dug out of the mud and delivered to the bottom of the ramp. Copyright 2005 by Andrzej Bochnacki. NOTE: The quotations above came from the book Different Story about Pyramids and are Copyright by Andrzej Bochnacki. All Rights Reserved. Kiedy mówimy "piramidy", to myślimy przede wszystkim o piramidzie Cheopsa. Dlaczego tak dokładnie według stron świata ustawiona jest podstawa piramidy? Dlaczego kąt nachylenia wynosi akurat 51°52’? Czy dziełem przypadku jest fakt, że połowa obwodu piramidy podzielona przez jej wysokość daje w wyniku liczbę zbliżoną do”π„? Dlaczego jedyny ślad powiązania piramidy z faraonem Cheopsem to znak kamieniarski na kamieniach, z których konstruowano puste przestrzenie nad Komorą Króla? Czy Komora Króla odsunięta jest od osi piramidy z powodów organizacyjnych prowadzenia budowy, czy na skutek błędu budowniczych? Dlaczego kanał uznawany za wentylacyjny usytuowany jest w najmniej właściwym dla tego typu kanałów miejscu, bo w bocznej ścianie komory i na dodatek 1 m nad podłogą? Jaki sens miała nisza wykuta we wschodniej ścianie środkowej komory nazywanej Komorą Królowej? Po co zbudowano nad górną komorą puste przestrzenie, nazywane niezbyt trafnie komorami odciążającymi, skoro zastosowane i wcześniej sprawdzone sklepienie namiotowe i tak wystarczająco zabezpieczałoby płaskie płyty sufitowe komory, tworząc co najwyżej pojedynczą pustą przestrzeń? Do czego służył lub miał służyć największy i najtrudniejszy pod względem konstrukcyjnym chodnik nazywany Wielką Galerią? Dlaczego część poziomego chodnika prowadzącego do Komory Królowej jest wykuta w istniejącym już wcześniej rdzeniu piramidy a nie murowana jak inne jego fragmenty? Skąd wziął się dość absurdalny (szczególnie przy założeniu warstwowej metody budowy piramidy) układ chodników, z którego wynika, że odgałęzienie skierowane do góry zaczęto w momencie, kiedy dwie górne komory jeszcze nie istniały? Jakie kryteria decydowały o miejscu rozpoczęcia chodnika i skierowania go do góry pod takim a nie innym kątem? Jakie to wyższe cele pozwalały kontynuować budowę dłużej niż świadome lata życia budowniczych? Jakie cele kazały Egipcjanom budować jedna za drugą duże kamienne piramidy przez 200 lat panowania III, IV i V dynastii faraonów? Dlaczego moda na duże kamienne piramidy była tak krótkotrwała w 5000- letniej historii starożytnego Egiptu? Dlaczego Egipcjanie opisywali wszystko oprócz budowy piramid? Czy setki ton czerwonego granitu sprowadzano z kamieniołomów leżących 1000 km na południe, w górnym biegu Nilu? Jaką metodą piętrzono bryłę piramidy, stopień po stopniu, czy inaczej? Kliknij na obrazek aby zobaczyc animacje. Skąd brano i jak transportowano kamienie? Czy człowiek może pracować na południowej ścianie piramidy, nagrzanej prostopadle padającymi promieniami słonecznymi ? Powstaje pytanie, co jest większym dziełem, pojedyncze piramidy, czy olbrzymie wyrobisko po kamieniach zużytych na ich budowę? Metoda powstawania piramid, przedstawiona przez Andrzeja Bochnackiego w ksiazce "O Piramidach Inaczej" przynosi revelacyjne i możliwe do zaakceptowania odpowiedzi na powyzsze pytania. Na tej stronie prezentujemy kilka fragmentow z tej ksiazki. Cliknij po szczegoly: "O Piramidach Inaczej" - specialna oferta. Fragment ksiazki Andrzeja Bochnackiego "O Piramidach Inaczej"
Zacznijmy więc od szukania śladów metod transportu, jakie Egipcjanie zostawili po sobie. Zanim skorzystamy z legend o chodzących kamieniach, spróbujmy przeanalizować jeden z nielicznych rysunków obrazujący transport olbrzymiego posągu pochodzący z czasów XII dynastii czyli około 800 lat po piramidach. Właśnie ten rysunek narobił najwięcej szkody w wyjaśnieniu metod transportu. Jego zbyt pobieżna analiza prowadzi do fałszywych wniosków. Jeżeli przyjmiemy jako główne założenie, że rysownik starał się jak najdokładniej przedstawić rzeczywistą scenę transportu posągu, to analizując treść rysunku powinniśmy znaleźć wyjaśnienie co najmniej czterech jego cech charakterystycznych nie spotykanych gdzie indziej. Po pierwsze, rysownik zadał sobie bardzo dużo trudu, aby przedstawić właśnie tyle osób w zaprzęgu. Po drugie, jeden z czterech rzędów ciągnących zdecydowanie wyróżnia się strojem: co druga para ciągnących ma długie fartuszki, a pierwsza para posiada dziwaczne nakrycia głowy. Po trzecie, liny nie są zaczepione bezpośrednio do sań, lecz do elementu o nietypowym kształcie, który jednym końcem opiera się o płozy. Po czwarte, jeden z pracujących najprawdopodobniej wylewa jakąś ciecz z przodu sań. Ponieważ jest rzeczą fizycznie niemożliwą aby 166 ludzi było w stanie ciągnąć liny z siłą co najmniej rzędu 9 ton, należało szukać rozwiązania w zastosowaniu jakiegoś urządzenia umożliwiającego przełożenie sił i oczywiście znaleźć punkt oparcia umożliwiający zwiększenie siły. O ile nie jest rzeczą trudną znalezienie odpowiedniej maszyny prostej umożliwiającej zwiększenie siły, o tyle trudno było znaleźć na rysunku interpretację punktu oparcia. Dopiero próba znalezienia przyczyny, dla której jeden szereg ciągnących różni się od innych, pomogła znaleźć wielce prawdopodobną interpretację rysunku przedstawioną na szkicu poniżej. Rys. 22. Przestrzenny rysunek transportu posągu. Egipcjanie nie rozważali problemów ciągnięcia ciężkich głazów i posągów teoretycznie, oni to po prostu realizowali w praktyce. Sprawdzili, że nawet 300-tu czy 400-tu ludzi nie dałoby rady ciągnąć z siłą przekraczającą 9 ton. Liny z włókien oprócz szeregu zalet, mają jedną uciążliwą wadę, rozciągają się. Wydłużenia liny zależą oczywiście od wielkości siły rozciągającej, rodzaju splotu i długości liny. Gdyby kilkudziesięcioosobowy szereg ludzi usiłował ciągnąć za pomocą jednej liny, to ostatni w szeregu musiałby zrobić o kilka kroków więcej od pierwszego zanim lina uzyskałaby właściwe naprężenie. Każdorazowe zwolnienie napięcia zmuszałoby do wykonania ponownej pracy naprężania (niebagatelnej), a znajdowanie coraz nowych punktów oparcia dla nóg i zachowanie równoczesności działania wszystkich 50 ludzi jest mocno wątpliwe. Ludzie ci mogliby co najwyżej szarpać liną i byłoby to zajęcie bardzo mało efektywne. Egipcjanie znaleźli genialne rozwiązanie. Okazuje się, że kiedy ludzie starają się utrzymać uciekającą z rąk linę, sytuacja diametralnie się zmienia. Rozciągliwość liny przestaje przeszkadzać, nogi pozostają w miejscu, najwyżej ręce zmienią miejsce chwytu. Oprócz tego, człowiek trzymając uciekającą linę nie wykonuje pracy, w rozumieniu siła razy przesunięcie, jest w stanie utrzymać znacznie więcej niż ciągnąć. Egipcjanie stworzyli coś w rodzaju ruchomego punktu podparcia składającego się z trzech rzędów ciągnących, którzy byli w stanie stawić chwilowo opór rzędu 65 kG każdy, co dało w sumie siłę oporu równą około 8 ton. Dopiero czwarty rząd, właśnie ten wyróżniający się ubiorem, najważniejszy, bo wymagający równoczesności pracy, był tym rzędem ciągnących, który wykonywał właściwą pracę przeciągania posągu. 43 ludzi ciągnęło z siłą 25 kG każdy, co dawało w sumie ponad 1 tonę. Przy zastosowaniu bardzo ciekawego elementu, w postaci belki drewnianej o niezwykłym kształcie, umożliwiającego przełożenie około 1: 9, mogli oni wywierać na sanie z przymocowanym do nich posągiem, siłę 9 ton. Była to siła wystarczająca do ciągnięcia posągu, tym bardziej, że obie strony, ciągnąca i dająca oparcie, dysponowały pewnym zapasem. Przyjmując proporcje wymiarowe rysunku możemy w przybliżeniu ocenić wielkość przesunięcia posągu w jednym cyklu pracy. Jeśli przyjmiemy za możliwy 60° obrót belki w specjalnym gnieździe na końcu płóz, to przesunięcie sań mogło wynosić około 6 cm, w tym czasie szereg ciągnących przesunąłby się o 54 cm, następnie ciągnący cofnęliby się o 48 cm, szeregi stawiających opór przesunęłyby się do przodu o 6 cm (nie wykonując żadnej pracy) i cykl mógłby się powtórzyć. Najbardziej obciążonym elementem byłoby gniazdo obrotu belki w zakończeniu płóz. Naciski występujące w tym miejscu z całą pewnością wymagały polewania wodą. Rys. 23. Sposób zamocowania belki do sań na wzór stawu kolanowego. Rys. 23 a. Wyjaśnienie sposobu zwiększenia siły ciągnącej. Czyżby więc Egipcjanie potrafili wykorzystywać zjawisko względności ruchu i stosować nieznane nam współczesnym maszyny proste. Prawdopodobnie byli jedynie doskonałymi obserwatorami przyrody. Jeżeli uważnie przyjrzymy się pracy konia lub wołu podczas wykonywania ciężkich prac np. orki, to nietrudno zauważyć, że koń ciągnie pług wbijając się trzema kopytami w ziemię. Te trzy kopyta, podobnie jak trzy szeregi napinających liny robotników na rysunku, to punkt oparcia dający możliwość wykonania pracy przesuwania posągu lub wyorania skiby ziemi. Czwarta noga podobnie jak czwarty szereg robotników wykonuje znacznie większy krok do przodu niż przesunięcie pługa. Różnice wynikać będą jedynie z różnych sposobów wywierania siły oraz z faktu, że nogi końskie naprzemian zmieniają swoje funkcje, a szeregi ciągnących mają funkcje przypisane na stale. Jeżeli przyjrzymy się kolejnemu rysunkowi przedstawiającemu ten tajemniczy element, do którego przymocowane są liny ciągnących posąg i obok przekrój przez staw kolanowy konia, to nie będziemy się dziwić w jaki sposób Egipcjanie wynaleźli nietypową maszynę prostą umożliwiającą zwiększenie wywieranej siły. Nawet jeżeli przezorni Egipcjanie wyłożyli powierzchnię gniazda blachą miedzianą, belka na pewno z czasem zużywała się i trzeba było ją od czasu do czasu wymieniać, dlatego na rysunku widzimy ludzi niosących zapasową. Taka interpretacja rysunku dość jednoznacznie wyjaśnia znaczenie wszystkich nietypowych elementów widocznych na nim, pozwala przypuszczać, że Egipcjanie zdawali sobie sprawę, że bez zastosowania przełożenia siły nie ma mowy o optymalnym wykorzystaniu mocy człowieka. Człowiek nie lubi pracować ani bardzo wolno, ani bardzo szybko. Dzięki podobnym zaprzęgom budowniczowie piramid mogli znacznie zwiększyć gęstość strumienia kamieni na rampie poprzez znaczne, bo 3 lub 4-krotne zmniejszenie liczby ludzi ciągnących głazy. Gęściej ustawione na rampie sanie mogły poruszać się wolniej przy zachowaniu tej samej liczby kamieni transportowanych w ciągu jednego dnia. Nie odmawiajmy jednak Egipcjanom inteligencji. To co dobre w transporcie jednostkowym wyjątkowo ciężkich elementów, nie musi być optymalne przy transporcie niemal astronomicznych ilości typowych elementów. Mogli wykorzystać zasadę nie powielając bezmyślnie sposobu. w wersji e-Book (PDF) za $3.95 USD. Po potwierdzeniu oplaty, w ciagu 24 godzin otrzymasz ksiazke w wersji PDF. Kup ksiazke Andrzeja Bochnackiego "O Piramidach Inaczej" w wersji e-Book (PDF).